The popular game streaming site is now selling 51 games with more to come. Twitch is finally ready to take the wraps off its effort to sell games to the stream-watching masses. 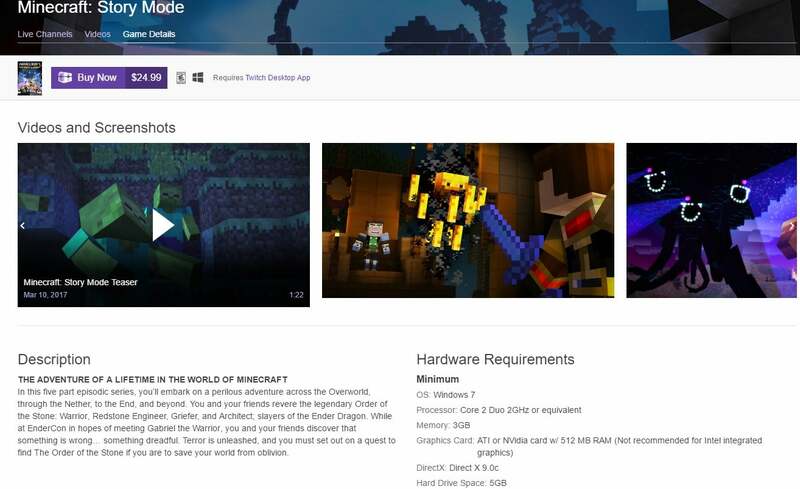 The Amazon-owned company now has 51 games for sale, 39 of which require the Twitch desktop app to launch. The others require different software or an account for that specific game. The five games from Ubisoft, for example, require Uplay, while Trion Reactor games use Glyph. You can find a complete list of Twitch-sold games on the site's blog. Games from Twitch are available in two different ways. Users can purchase them from each game's directory page on Twitch, or directly from a streamer's page when they're playing the game. Buying from a streamer gives that broadcaster a 5 percent cut of the purchase price if they have opted in to Twitch's revenue sharing plan. All purchases are handled through Amazon and pricing is in US dollars. A game for sale on Twitch. The one place you won't find Twitch's games for sale is the Twitch desktop client. While you have to use Twitch on the desktop to launch some games, the program doesn't include a dedicated store section, like you'll find with Steam or GoG's new Galaxy client. Perhaps future iterations of the desktop program will include a store. Any game that costs more than $5 comes with a Twitch Crate packing various digital extras, such as chat badges and special emojis. To celebrate its grand opening, Twitch is also running a giveaway. From now through May 1 anyone who receives a Twitch Crate will be automatically entered in draws for the Twitch Crates Gear Giveaway. Prizes change every week and include various kinds of gamer gear, including headsets, controllers, mechanical keyboards, gaming mice, and t-shirts. If you don't want to buy a game to enter the giveaway, you an also hand print a mail-in entry. Why this matters: Selling games on Twitch makes perfect sense. The site's an ideal place to showcase a game's appeal, with streamers giving honest reactions to the highs and lows of a certain game. It'll be interesting is to see if any streamers change the games they broadcast for the potential of earning extra revenue, however. There are many factors that would stop that from happening, such as the appeal of newer games to a broadcaster's core audience, and the awkwardness of changing to a game genre that a particular streamer is not known for. Nevertheless, Twitch game sales could impact the Twitch we know and love today.